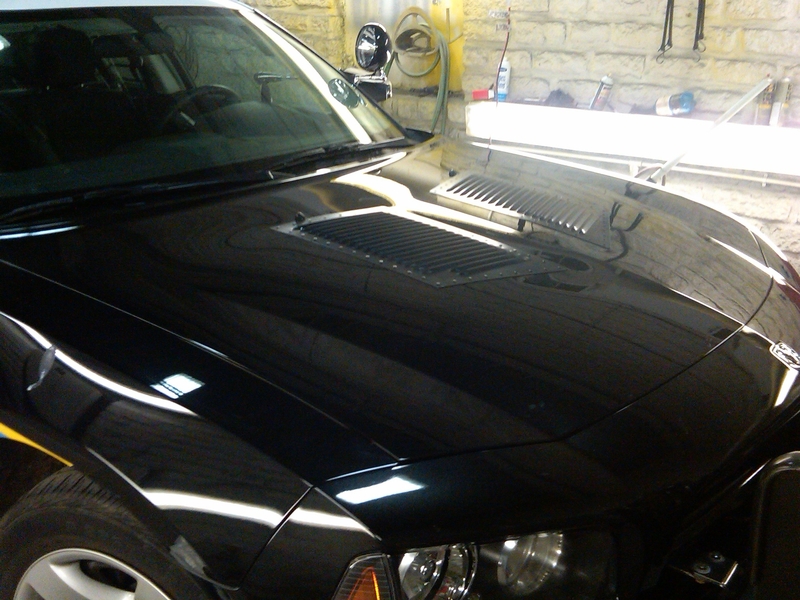 The new 2014 Ford “Interceptor” works just fine with Size Large RunCool Hood Louvers! — Officer Pete P., Camack Village Ark., P.D. Four Directions Search, Rescue and Recovery in Colorado says, “It is unbelievable how well they work. 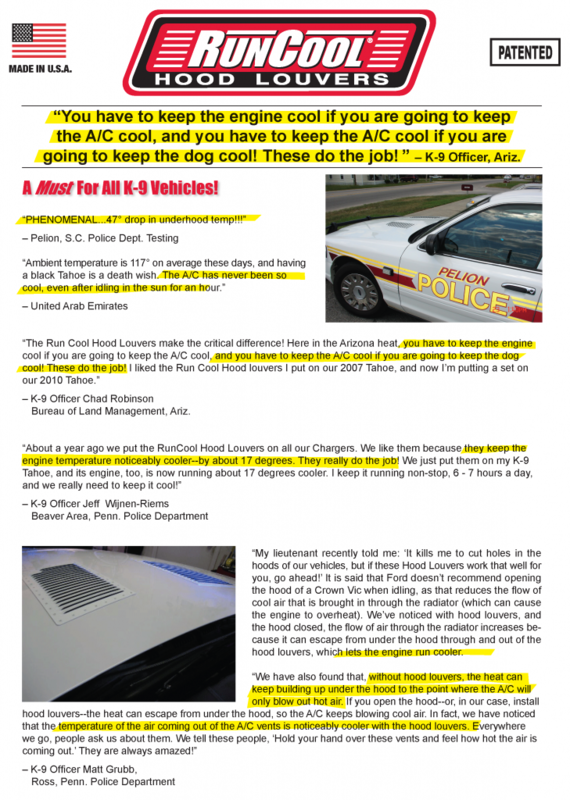 I would never believe the difference they could make.” In fact, testing by the Pelion, S.C. Police Department showed our hood louvers lowered under-hood temperatures by 47°. Desert tested and used by the U.S. Border Patrol. 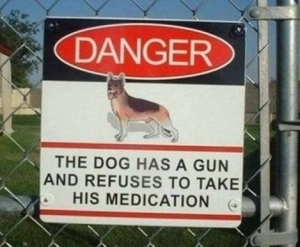 Price of a replacement K-9: $5,000 – $15,000. 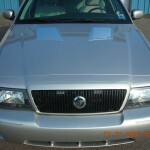 Price of a set of USBP-Spec Hood Louvers: $179. Professional Grade, (in White or Black Aluminum). Tested and used by the USBP, DHS, and Police and Sheriff K-9 units across the U.S.
For Law Enforcement Officers Only. 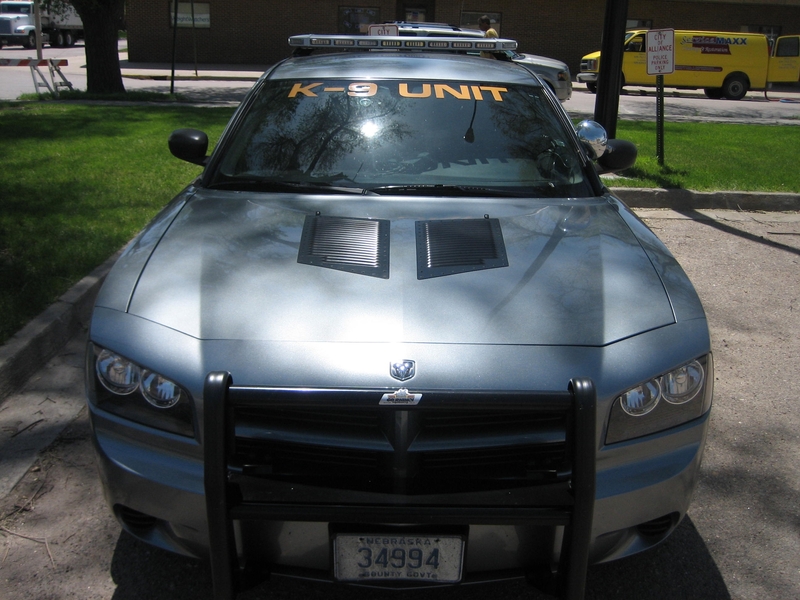 Free Stickers for your K-9 Unit and/or POV! (Size: 3″ X 9″.) 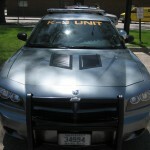 Just email request for “K-9 Sticker” to Cool@HoodLouvers.com. 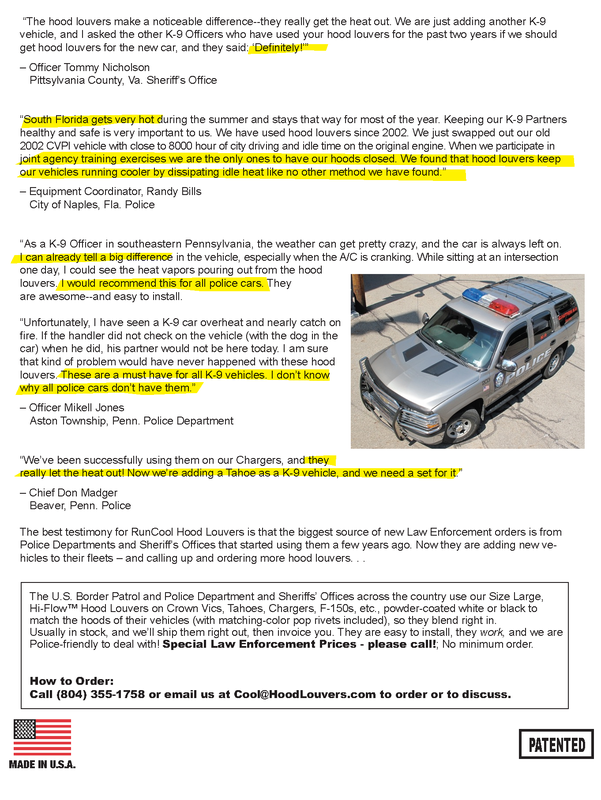 “As a K-9 Officer in southeastern Pennsylvania, the weather can get pretty crazy, and the car is always left on. I can already tell a big difference in the vehicle, especially when the A/C is cranking. 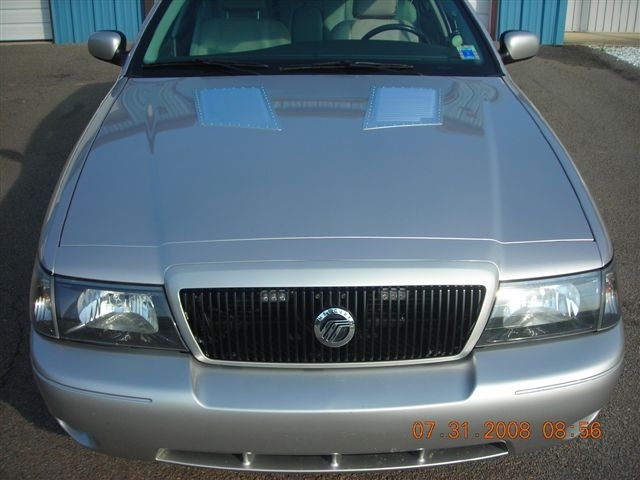 While sitting at an intersection one day, I could see the heat vapors pouring out from the hood louvers. 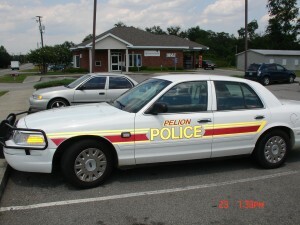 I would recommend this for all police cars. They are awesome–and easy to install. 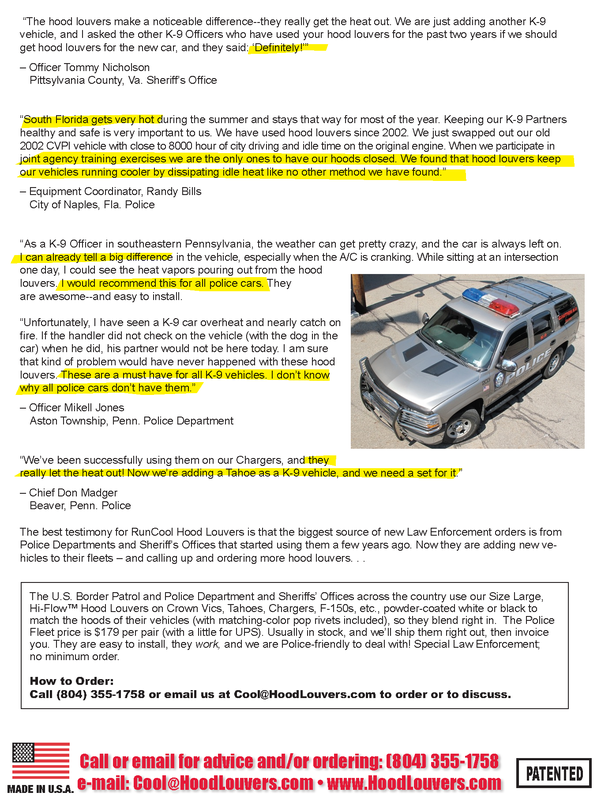 The best testimony for RunCool Hood Louvers is that the biggest source of new Law Enforcement orders is from Police Departments and Sheriff’s Offices that started using them a few years ago. 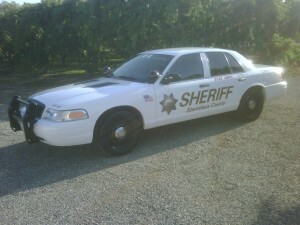 Now they are adding new vehicles to their fleets – and calling up and ordering more hood louvers. . . 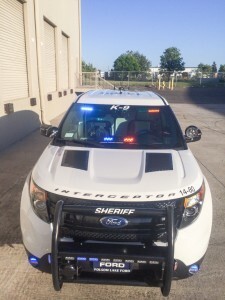 The U.S. Border Patrol and Police Department and Sheriffs’ Offices across the country , use our Size Large, Hi-Flow™ Hood Louvers on Crown Vics, Tahoes, Chargers, F-150s, etc., powder-coated white or black to match their vehicles with matching-color pop rivets (included). 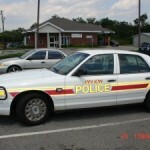 Call for the special Law Enforcement Discount Price. Usually in stock, and we’ll ship them right out, then invoice you. 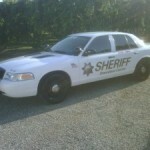 They are easy to install, they work and we are experienced with Law Enforcement agencies! or email us at Cool@HoodLouvers.com .